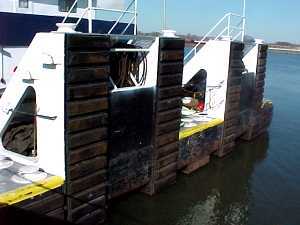 -----Towboats don't tow - and they have knees! What's it like to work on a tow? We've never done it, but we talked with many who have. We thought you might be interested in the lives of our neighbors. -----We live aboard our little boat during most of the year. It is a marvelous lifestyle, drifting down the rivers and cruising the coasts of America. This way of living allows us to enjoy the wildness, towns, beauty, industry, and cultures of our great country. There are those, however, who ply these same waters for a living. Some are fishing, some dredging, some digging clams or mussels, and some working the towboats. The towboats are fascinating, and occasionally frightening. 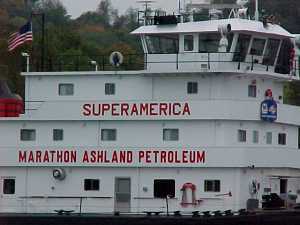 They are our working neighbors on most of the waterways we have traveled in the eastern half of the United States. We have marveled at their skill in handling long strings of barges, their courtesy toward each other and their concern toward us as small boats on 'their' rivers. 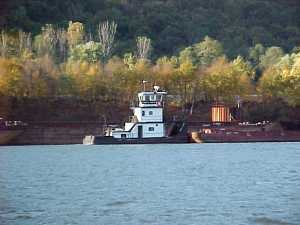 Coming down the Ohio River in late fall, tows were about the only other boats on the river with us. We decided it was time to learn more about our neighbor's lifestyle. We read everything we could find about their lives and work, talked with them on the radio, tied off with them locking down the river, and visited with those who have worked on or with tows. We have decided to share what we have learned. -----There are over 16,000 miles of Inland Waterways in the United States (including the Intracoastal Waterways along the Gulf and Atlantic coasts). These miles are maintained by the Army Corps of Engineers. Most of these Waterways are plied by towboats and their attendant barges. If you cruised about 300 miles per month on these waters, it would require about four and a half years to see the Inland Waterways of America! The canals of Europe certainly sound romantic, but for the serious inland cruiser, North America is Mecca. -----Your neighbors for most of this cruising would be towboats. 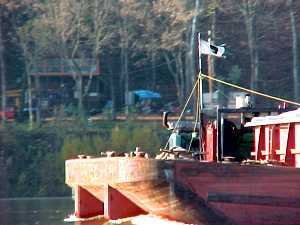 Oh, by the way, the tows on the Inland Waterways don't tow - they push, with two vertical "knees" on their bow to push against the barges. -----JOffshore, on salt water, or sometimes in the Great Lakes, tows will tow their barges using long cables - a distinct deterrence to small boats cutting between the tow and the barges that may trail ¼ mile behind. -----JThe tows on the Waterways are big. They are about 150 feet long with a 45-foot beam and weigh about 730 tons. Most are powered by two six-cylinder diesel engines, each with over 2,000 horsepower. Their fuel tanks may hold 100,000 gallons (although they are rarely full since that would increase the weight of the tow). They can carry 10,000 gallons of water. 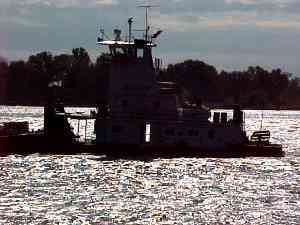 A typical tow is three decks high, with a pilothouse on the top. -----There are usually eleven crewmembers. The top deck often houses a captain's cabin and a guest cabin. There is also an electronics room on this floor. The port side of the middle deck often has a cook's cabin and two deckhand cabins, equipped with bunk beds. The starboard side is the pilot's cabin and two more deckhand cabins. Each cabin usually has a toilet and shower. The forward part of the bottom deck is the 'doghouse' - the workroom for the crew. Aft, on the starboard side of this deck, there is usually a galley, pantry, dining area, and toilet. The port side houses the crew lounge (with TV and videos), the laundry room, a cabin for the chief engineer, and the control room for the engines. Some towboats even have a small 'store' where the crew can buy items ranging from stamps to soft drinks (no alcoholic drinks are ever allowed on a tow). Sometimes crew may check out books from the 'store'. -----Barges carry the produce. 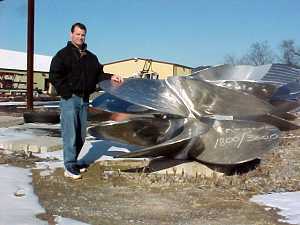 They are often 'stored' along riverbanks or in harbors, tied off against cells, docks, or trees. These 'fleeting areas' are often marked on charts. Fortunate that is, since one passes these areas in a small boat with caution as small work tows busy themselves around the fleet like honey bees at a hive. Oftentimes, we see the work tows assembling a string of barges for the long-distance towboat waiting patiently tied off against a cell. 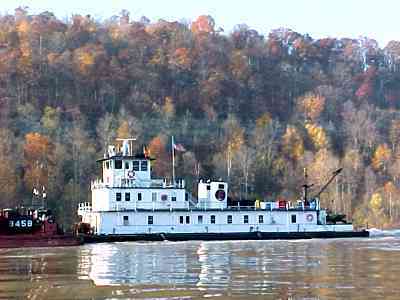 -----A standard barge is 195 feet long and 35 feet wide, but they may vary in length from 147 to 290 feet. 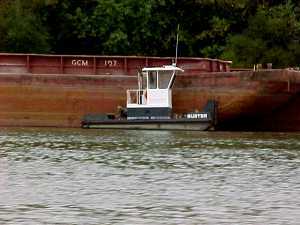 The standard barge carries about 1,500 tons (52,500 bushels, or 453,000 gallons). It would require fifteen one-hundred-ton hopper railroad cars or sixty twenty-five ton trailer trucks to carry an equivalent load. -----The bulk agricultural produce is usually grain, corn, rice, oats, or soybeans. 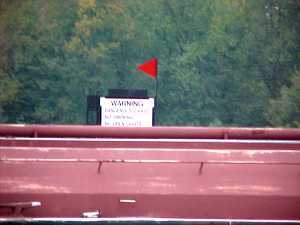 Liquids include petroleum and chemical fluids (with these barges marked by red flags, now usually a red metal triangle mounted amidships). 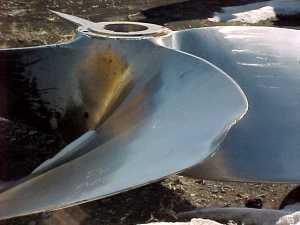 Scrap steel, coal, salt, cement, sand, and gravel are among the most common cargos. 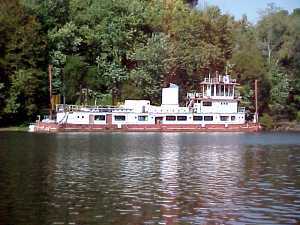 We have seen barges loaded with everything from R.V. 's to bird watchers. -----Barges are lashed together into a string. On larger waterways, they are typically three across and five long, making the tow and fifteen barges in the string about 1,125 feet long, or almost four football fields. They are 105 feet wide and the total may weigh 23,230 tons, or the equivalent of 225 railroad cars or 870 large trucks. On the lower Mississippi, some barge strings total as many as forty-eight barges! Underway at five knots, they sure can't stop on a dime. 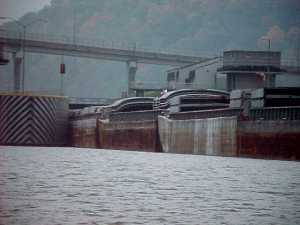 It is an amazing feat to watch them navigate a tight turn in a river or squeeze into a lock. 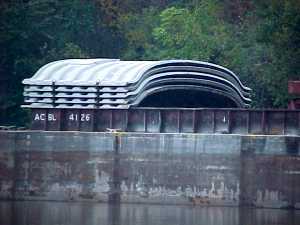 ----In 1998, more than a half billion ton-miles of goods were shipped on barges along the Inland Waterways, almost half of the total on the Ohio and Mississippi Rivers alone. The Environmental Protection Agency estimates that towboats emit 35-60% less pollutants than either railroad locomotives or trucks, so the tows are 'environmentally' friendly to our air. Trains and trucks also use between 300 and 800% more fuel. For bulk produce, without a strict time constraint, movement by barge is economical. 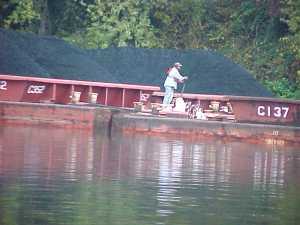 ----Within a few miles of where I am writing this, coal from the western US is dropped from railroad hopper cars directly into barges for trans-shipment up the Cumberland and Tennessee Rivers to power plants. 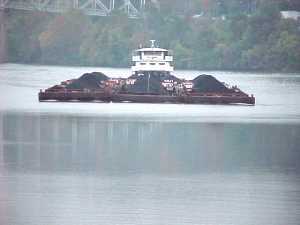 It is cheaper to trans-ship by barge than to continue the coal haulage by rail to the plants. 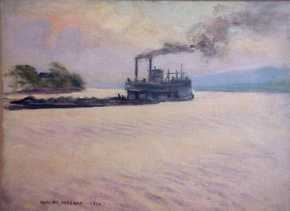 Barge freight rates are traded daily on the St. Louis Merchants Exchange. Tariff rates vary with supply and demand. 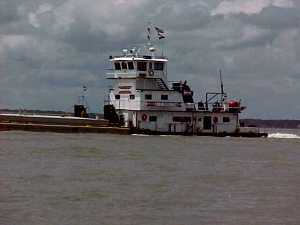 ----As with most forms of transportation, time is money, so towboats work twenty-four hours a day. 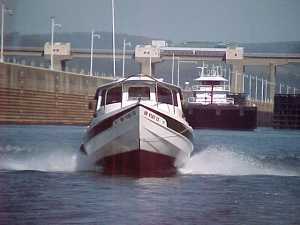 Many are equipped today with a computer that calculates water depth, current speed, draft, and the speed of the towboat. It then computes the best speed for greatest efficiency. 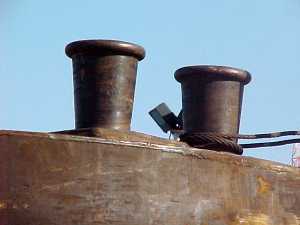 Computers keep the log, and suggest the best arrangement of the barges in the string to facilitate adding new barges to the tow or dropping off singles en route. 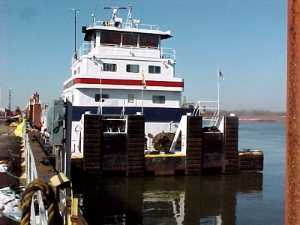 -----What's it like to work on towboat? It is a difficult life. The crew on a tow lives aboard for about half their lives. They are usually on the boat for thirty days, and off for thirty. Some companies work 28's, 21's, or 30 on and 15 off. These are long periods to be away from home and family, and the stress on families often shows in high divorce rates. The eleven crewmembers usually work two six-hour shifts every day. The front watch works from six a.m. to noon and from six p.m. until midnight. The after watch works from noon to six p.m. and from midnight to six a.m. Since the crew eat, bathe, do laundry, and all the myriad details of life during their two six-hour stretches off, they never get to sleep for long stretches. The Captain rotates his duties with the Pilot, although the Captain is always responsible for the boat. The crew considers these men 'management'. 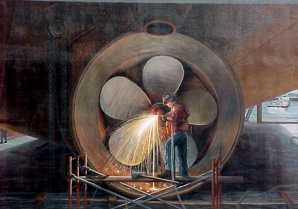 ----- There is a chief engineer, responsible for the engines, and a cook. There are three deckhands, and often a tankerman (a deckhand who is certified to be responsible for 'red flag' cargo). The deckhands keep the boat clean, waxed, polished, and painted. 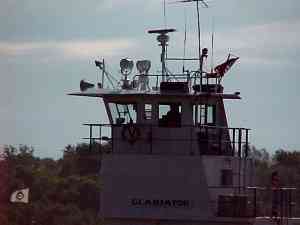 They maintain running lights and depth sounders on the lead edge of the string of barges. 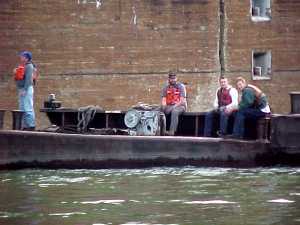 They are responsible for the barges. They do 'tow work', building and breaking apart the tow by lashing barges together with wire cables called rigging. 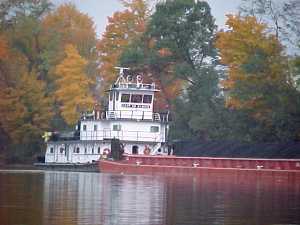 This is often a constant job, since barges are added or dropped off at different points along the river. They check to be sure the rigging is tight while running. 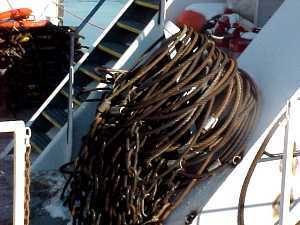 Since the string of barges is often longer than the locks, deckhands also 'make a lock,' by tying and untying the rigging as they break the strings for lock passage. This work is hard and often dangerous. On the Ohio, they belong to the steelworkers union. -----Two mates alternate shifts in charge of the deckhands. The mates are teachers, bosses, enforcers, referees, and usually good listeners. ----Most boats have an eleventh crewmember, either a deckhand in training or a call watchman. The call watchman does not work the standard shifts, but is on call as needed for locks and tow work, or he works from 0600 to 1800 and is off for twelve hours. 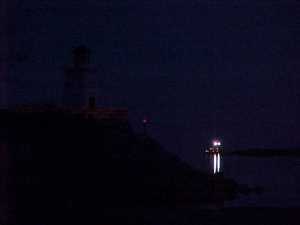 ----Therefore, on any one shift, there is a skipper, a mate, and two deckhands on duty, and sometimes a call watchman. The Chief engineer and cook work as required by their jobs. -----The crew work in all kinds of weather, and, depending upon the job, much of the work is outside. 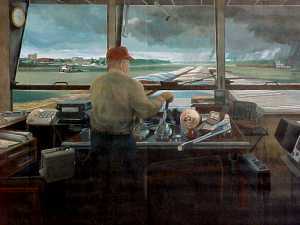 In particularly bad weather, a crewmember often stands lookout on the leading edge of the barges to radio to the skipper with a hand-held radio. A lookout often 'talks through a bridge' as well, since they can never be taken for granted. In a crosswind or running down current, they can be especially difficult to navigate. -----Pay scales differ depending upon the job and the company. Generally, a captain receives $250-$400 per day and a pilot from $200 to $350. A chief engineer receives from $225 to $350 and an assistant engineer (after an apprenticeship from one to three years) from $125 to $175. A mate might receive (after two to six years to reach this position) from $115 to $225 and a watchman (from one to four years) from $100 to $180. A top deckhand (three trips to one year) earns from $75 to $165 and a deckhand from $50 to $100. A cook may earn from $75 to $165 per day. 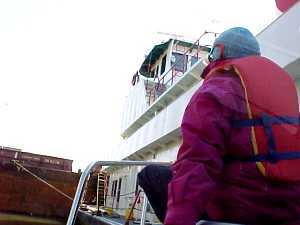 -----Life is close on a towboat. Living together for thirty day stretches of hard work and short sleep can be difficult. Many try for this work and many drop out. It is said that if a crewmember wears out a pair of boots, he will likely stay on the boats a working lifetime. 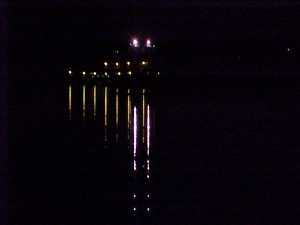 -----We always monitor the commercial frequencies on the marine radio as we travel the Waterways. We hear the tows tell their positions, so we are aware of their location around a bend or coming into the main channel from a tributary. They alert each other (and therefore us) of any hazards. Before we pass a tow, we often radio to let them know our intentions and hear any suggestions they might have for the safest passage. El is our radio operator, and we have found that tow captains often enjoy visiting with her on the radio. They have told her of anchorages, navigation dangers, and the stories of their lives. One told her where his folks lived, and asked us to stop by their dock and say "hello," and we did. Always, on the radio, they are courteous with each other - almost to a fault. Their accents and idioms are fascinating. One fellow commented to another that he was going so fast his "ears were flapping in the wind." The other answered, "Why if'n Ah slowed down to six knots, Ah'd drop off plane." One chap answered an impatient lockmaster who was wondering what was taking him so long to get to the gate, "Man, the closer you are, the longer it takes." They are professionals, with a twang.